...and a very big Welcome to new friends. Welcome and Happy Mother's Day to all the very special Mothers out there. Feasts celebrating mothers have existed throughout the world since the beginning of time. The modern version of Mother's Day in the United States, was first observed in 1907, when Anna Jarvis of Philadelphia decided that it would be a wonderful way to honor her deceased mother. Two years later, Jarvis and friends began a letter-writing campaign to create a Mother's Day observance. 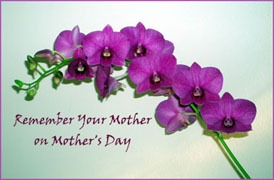 Soon after, in 1914, the US Congress passed legislation designating the second Sunday in May as Mother's Day. Mother's Day has become very commercialised but it is a day when we can all remember our Mothers, what they have done for us and how very special it is to be a Mother. I will be spending the day with my Daughters in Townsville and attending a special Ladies High Tea at which Katelyn will be showing off some of her beautiful creations. Hope you are all doing something special. A mother was invited for dinner at her son Brian's apartment. During the course of the meal, Brian's mother couldn't help but notice how beautiful Brian's roommate, Jennifer, was. Brian's mom had long suspected a relationship between Brian and Jennifer. Over the course of the evening, while watching the two interact, she started to wonder if there was more between them than met the eye. About a week later, Jennifer came to Brian saying, "Ever since your mother came to dinner, I've been unable to find the beautiful silver gravy ladle. You don't suppose she took it, do you?" Brian said, "Well, I doubt it, but I'll send her an email just to be sure." So he wrote: "Dear Mom: I'm not saying that you 'did' take the gravy ladle from the house, I'm not saying that you 'did not' take the gravy ladle. But the fact remains that one has been missing ever since you were here for dinner. Love, Brian." Several days later, Brian received an email back from his mother that read: "Dear Son: I'm not saying that you 'do' sleep with Jennifer, I'm not saying that you 'do not' sleep with Jennifer. But the fact remains that if Jennifer were sleeping in her own bed, she would have found the ladle by now. Love, Mom." Mackay's Moral: Never lie to your mother ... or anyone else. Most of us are aware that we should drink more water, some of us don't see that it's necessary and drink very little water, others realise they don't drink enough and are 'going to try to drink more'. I, for one, keep telling myself that I should drink more water .... but I never thought of it before as being a possible cure for many of the health problems that people suffer from today. Arthritis, asthma, autism and other birth defects caused by the mother being dehydrated, most back problems (without enough water & salt the body cannot produce enough cartilage to prevent joint degeneration), cancer, high cholesterol which only appears when the body needs it to prevent water loss in cells, circulation problems, depression, diabetes, fibromyalgia, headaches, lupus, Multiple sclerosis, muscular dystrophy, obesity, osteoporosis, scleroderma & most skin problems and thyroid problems. It would seem far too simple to imagine that we could actually cure any of these problems just by adding water and salt to our diet. But, according to Dr Batmanghelidj who is the Author of Your Body's Many Cries for Water you can do just that. "You're not sick, you're thirsty. Don't treat thrist with medication." I have outlined his "Water Cure" in more detail on my Wellness Choices Blog or you can read all about it at http://www.watercure.com - well worth reading! Hydrating your body with pure water is important to flush toxins from your body, give your skin a healthy glow and increase your energy. Staying well hydrated offers many health benefits. You are more likely to have smoother skin, regular bowel movements, have increased resistance to infections because of the moisturizing effect on the mucous lining of the respiratory tract and lower the risk of kidney stones and urinary tract infections. To add great nutritious flavour to your pure water, slice up some cucumber and add fresh mint, let it sit in a pitcher or glass for about 30 minutes, stir well and enjoy. Do You Want Something? .. Will You Pay the Price? The great sin - Gossip. The great crippler - Fear. The greatest mistake - Giving up. The most satisfying experience - Doing your duty first. The best action - Keep the mind clear and judgment good. The greatest blessing - Good health. The great gamble - Substituting hope for facts. The most certain thing in life - Change. The greatest joy - Being needed. The cleverest man - The one who does what he thinks is right. The most potent force - Positive thinking. The greatest opportunity - The next one. The greatest thought - God. The greatest victory - Victory over self. The best play - Successful work. The greatest handicap - Egotism. The most expensive indulgence - Hate. The most dangerous man - The liar. The most ridiculous trait - False pride. The greatest loss - Loss of self confidence. The greatest need - Common sense. I love to receive your questions, comments or requests so please contact me if you have anything you'd like to contribute or any questions.